We’ve been busy dyeing everything in sight with our new shade, Coral. 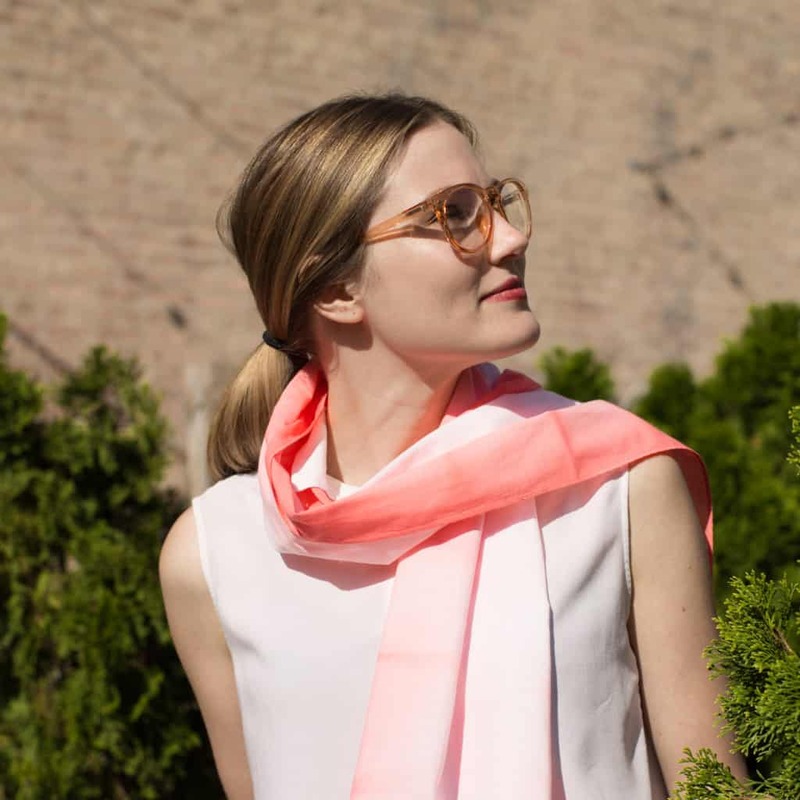 We found this beautiful summer scarf and knew an ombré pattern would add such a beautiful effect to it. This was one of the easier projects to do and the most fun to date! Learn how to get this look below. For best results, prewash scarf, dry and iron flat. This will make accordion folding easier. Fold scarf in half lengthwise, end to end. Then accordion fold scarf, like a fan, horizontally in equal folds about 4” wide. Iron folds as you go. This will create an interesting pattern with sharp fold lines. Divide folded scarf into thirds and mark each third with a pin to use as a guide when dip-dyeing. Fill a large container with 3 gallons of very hot water (140F). If the water is not hot enough, heat water on the stove or in the microwave and add it to the dyebath. Shake dye bottle before measuring. Wearing rubber gloves, add 1½ teaspoons of Coral All-Purpose Dye. Stir well. Add 1 cup of salt to dyebath and a squirt of liquid dish detergent. The salt helps to intensify the color. Stir well. Test dye color by dipping a paper towel into the dyebath. If color is too light, add more dye; if it is too dark, add more water. Fold dry scarf in half over your fingers so the long side edges and pins are matched up. With scarf draped over your fingers, dip outer edges (or sides) of scarf in dyebath up to the pin marks for 3 to 5 minutes, slowly move fabric up and down to be sure the dye penetrates all the layers. When the desired color is achieved, remove scarf from the dyebath. Wearing latex gloves, carefully squeeze out excess dye. Set scarf aside, being careful not to let dye touch the white areas. We strongly recommend using Rit ColorStay Dye Fixative immediately after dyeing and before washing. It enhances the color, increases color retention and prevents dye from bleeding into white areas. We used the Spray Method. Remove pins and open scarf. Drape over a plastic bin or in your sink. Spray scarf over the dyed areas. Let set for 20 minutes. Rinse scarf with cool water until rinse water begins to run clear. Then wash in warm water with mild detergent. Rinse and hang dry.